Hasbro coined the term, "Family Game Night," and while we don't love that Hasbro is lacking eco-friendly game options, we do 100% agree that family game night is an excellent plan. 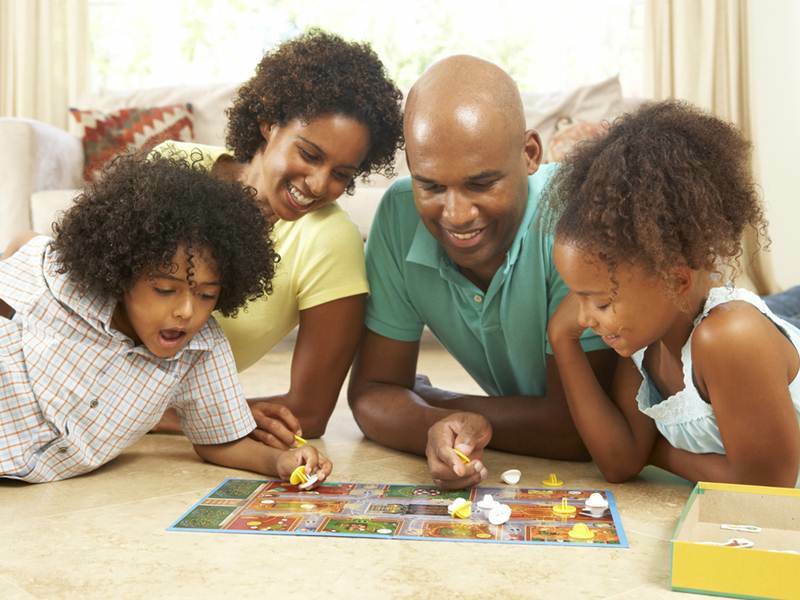 Regular family game nights help your family create tradition and build memories. Family game night can be fun and educational at the same time, teaching both little ones and older kids skills related to patience, perseverance and teamwork. Game night can help you relax after a long day, allows you to have great conversations with your family and best of all, offers an alternative to all that screen time kids get nowadays. Plus, game night is for everyone. There are plenty of games for younger and older kids. If you want to play a more advanced game, you can always create teams, mixing younger kids in with older players. At our house we usually play a short game each weeknight night and longer, more in-depth games on weekend evenings. Some of our favorite games include Yahtzee, Cranium, Apples to Apples, Name 5 and many others, but unfortunately, these games are missing an important eco-friendly component. If it's green games you're looking for, you have to look hard, because they're rare. Lucky for you, we've rounded up some of our favorite eco-minded game ideas below. Check them out, then schedule your own family game night ASAP. eeboo offers a number of eco-friendly games for all ages. eeboo games are plastic-free and made with recycled materials and non-toxic inks. Beyond being made with safe materials, many eeboo game focus on teaching little ones about green issues, with themes surrounding gardening, science and nature. Note that eeboo games are best for younger children. Earthopoly manages to celebrate the planet while capturing the classic fun of Monopoly. In Earthopoly players try to become earth champions by becoming the caretakers of wondrous locations around the planet and then increase the property value by collecting Carbon Credits and trading them in for Clean Air. If you waste energy or take long showers you pay a fine and instead of being tossed in jail, luck might just throw you in the landfill. This board game is made with recyclable paper and vegetable oil-based ink. The game playing tokens are super unique and because they’re all made by nature, they vary based on availability. For example, various playing tokens have included a lima bean or giant corn purchased through a local grocer, bamboo ring and a piece of natural crystal. If the weather is nice, you can always move family game night outside with a rousing game of V:King. 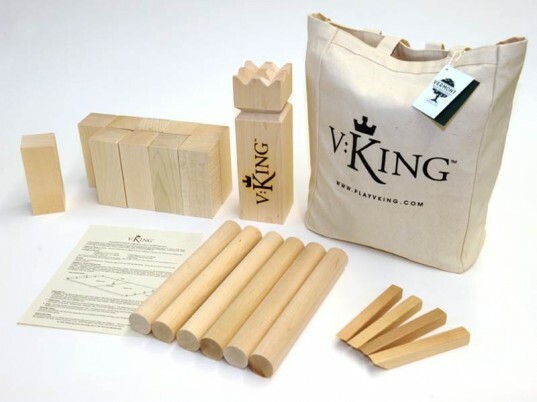 V:King, in the past known also as Kubb, is a game you play outdoors, on your lawn, that involves using battle axes to topple your opponent’s Shields in order to claim victory, and of course, the crown. V:King is based on a centuries old Swedish viking game and it’s not only fun, but will get your whole family moving, something we here in America could use more of. Age, strength and speed don’t matter in this game, as a mixture of luck, skill and strategy result in the champion team. + V:King offers an eco-friendly version of this fun game, made with northern hardwoods sourced from a local supplier to decrease transportation emmissions. The game is also paint, glue, chemical and toxic-stain free, plus comes in a sturdy cotton canvas storage bag printed with environmentally friendly, non-phthalate, non-PVC Plastisol ink. To avoid excess packaging V:King comes in a custom recycled cardboard box. Learn the rules of V:King and then set your sights on the crown. Even if you’ve got a small family unit, game night isn’t out of the question. 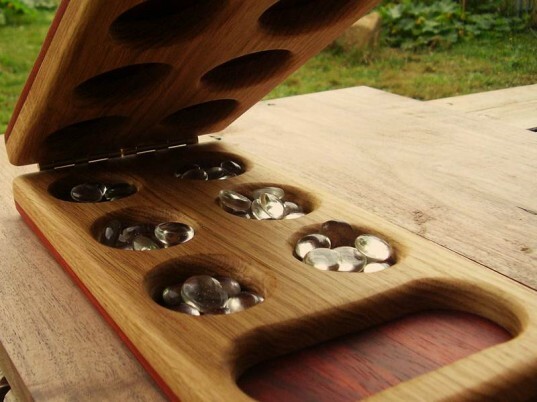 Plenty of games can be played with just two players, and one of our favorites is Mancala. Mancala is a totally engaging two-player board game that teaches skills related to counting, strategy and patience, but also it’s really fun, relaxing and battery-free, offering awesome old fashioned kid-powered fun. You’ll adore Mancala, so you may as well invest in a beautiful, eco-friendly version that will last forever. The set you see above is eco-friendly, made with gorgeous solid wood, non-toxic glue and a simple finish of linseed oil. If you need help to get started, check out this Mancala primer. Need other good two-player game night ideas? Try chess, checkers, Battleship, Pictureka or Blokus. Pictionary is a favorite game at our house. Sadly, Pictionary is far from eco-friendly, due to all those pads of paper, which aren’t recycled content. Sure you can recycle the paper, but wouldn’t it be better to skip paper altogether? Still, if you love Pictionary, it’s a snap to eco-it up. First head to your local office supply store and pick up a nice big whiteboard. Alternatively, you can get some eco-friendly whiteboard paint that turns any smooth surface into a whiteboard. Then pick up some AusPen whiteboard markers. These whiteboard markers are some of the greenest on the market and were created with the purpose of keeping toxic waste out of local landfills. Each AusPen whiteboard marker is made with 90% post-consumer recycled material, non-toxic ink and they’re refillable! When you’re ready to play Pictionary, simply get your whiteboard and markers out and have fun with a more reusable Pictionary experience. Note: All the kids at my house are 11 years+ and they even sometimes have trouble with the harder cards in regular Pictionary. If you’ve got younger kids, try Pictionary Jr. This wonderful Boggle set is a must-have, with all the fun and learning of old-school Boggle but comes in a much greener package. 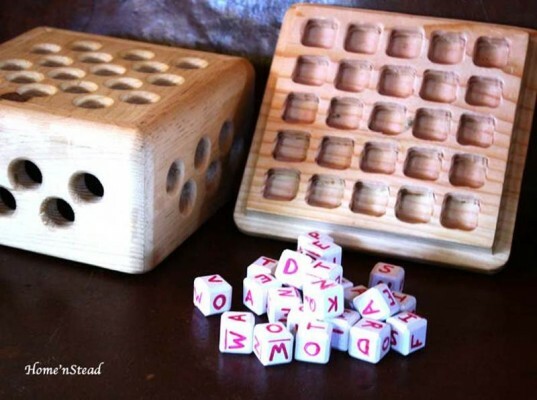 Made with wood, not plastic this heavy duty Boggle set is sure to last years, allowing your kids to develop letter recognition as well as spelling and reading skills. This handmade Boggle is the official size and letter count of the original big boggle game. This is a great educational game for kids and if you have a color preference for the letters you can let the shop know and they’ll oblige. Family Passtimes from Canada has some amazing cooperative eco-friendly games. My family loves a game called Pengoloo, its a concentration like game that uses wooden penguins to hide different color eggs. it's the most darling game ever and the pieces are all wood and coated in nontoxic water based paint, they also plant 2 trees for every tree cut down. what fun! Earthopoly manages to celebrate the planet while capturing the classic fun of Monopoly. 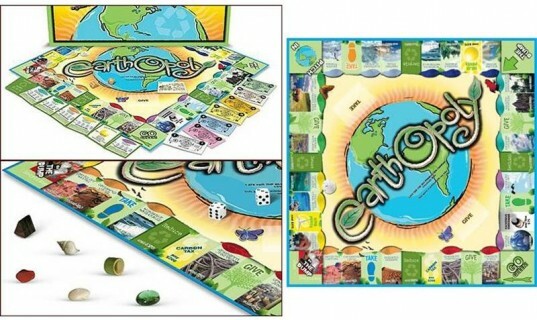 In Earthopoly players try to become earth champions by becoming the caretakers of wondrous locations around the planet and then increase the property value by collecting Carbon Credits and trading them in for Clean Air. If you waste energy or take long showers you pay a fine and instead of being tossed in jail, luck might just throw you in the landfill. This board game is made with recyclable paper and vegetable oil-based ink. The game playing tokens are super unique and because they're all made by nature, they vary based on availability. For example, various playing tokens have included a lima bean or giant corn purchased through a local grocer, bamboo ring and a piece of natural crystal. If the weather is nice, you can always move family game night outside with a rousing game of V:King. V:King, in the past known also as Kubb, is a game you play outdoors, on your lawn, that involves using battle axes to topple your opponent's Shields in order to claim victory, and of course, the crown. V:King is based on a centuries old Swedish viking game and it's not only fun, but will get your whole family moving, something we here in America could use more of. Age, strength and speed don't matter in this game, as a mixture of luck, skill and strategy result in the champion team. + V:King offers an eco-friendly version of this fun game, made with northern hardwoods sourced from a local supplier to decrease transportation emmissions. 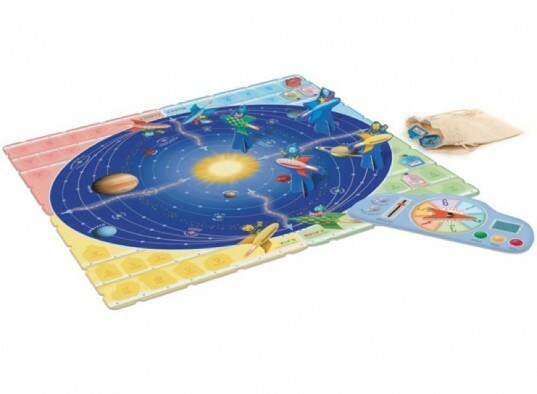 The game is also paint, glue, chemical and toxic-stain free, plus comes in a sturdy cotton canvas storage bag printed with environmentally friendly, non-phthalate, non-PVC Plastisol ink. To avoid excess packaging V:King comes in a custom recycled cardboard box. Learn the rules of V:King and then set your sights on the crown. Even if you've got a small family unit, game night isn't out of the question. Plenty of games can be played with just two players, and one of our favorites is Mancala. Mancala is a totally engaging two-player board game that teaches skills related to counting, strategy and patience, but also it’s really fun, relaxing and battery-free, offering awesome old fashioned kid-powered fun. You'll adore Mancala, so you may as well invest in a beautiful, eco-friendly version that will last forever. The set you see above is eco-friendly, made with gorgeous solid wood, non-toxic glue and a simple finish of linseed oil. If you need help to get started, check out this Mancala primer. Need other good two-player game night ideas? Try chess, checkers, Battleship, Pictureka or Blokus. Pictionary is a favorite game at our house. Sadly, Pictionary is far from eco-friendly, due to all those pads of paper, which aren't recycled content. Sure you can recycle the paper, but wouldn't it be better to skip paper altogether? Still, if you love Pictionary, it's a snap to eco-it up. First head to your local office supply store and pick up a nice big whiteboard. Alternatively, you can get some eco-friendly whiteboard paint that turns any smooth surface into a whiteboard. Then pick up some AusPen whiteboard markers. These whiteboard markers are some of the greenest on the market and were created with the purpose of keeping toxic waste out of local landfills. Each AusPen whiteboard marker is made with 90% post-consumer recycled material, non-toxic ink and they’re refillable! When you're ready to play Pictionary, simply get your whiteboard and markers out and have fun with a more reusable Pictionary experience. Note: All the kids at my house are 11 years+ and they even sometimes have trouble with the harder cards in regular Pictionary. 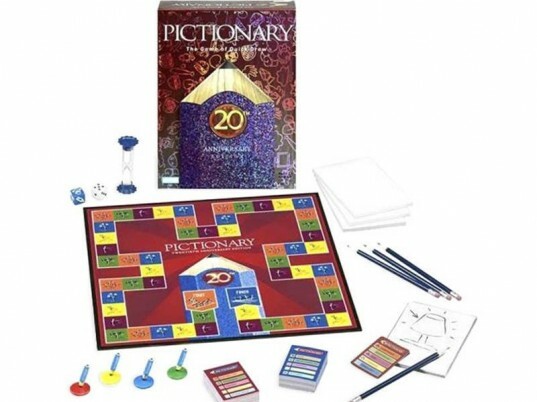 If you've got younger kids, try Pictionary Jr.